WELCOME TO THE OLD SMOKEY DISC GOLF COURSE!! 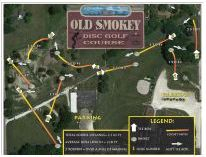 Below you will find an overview of the course, a course map, rules, links to Disc Golf resources and much more. Please be sure to take the course survey by clicking on the link provided at the bottom of the page and let us know what you think. Have Fun and Happy Golfing!! 1) All Professional Disc Golf Association Rules apply. 2) Please always be aware and courteous of pedestrians walking on the walk paths and others using the course. 3) Players should not throw until they are certain that the thrown disc will not distract another player or potentially injure anyone present. 4) Course is open from dawn to dusk. No loitering permitted on park district grounds after dark. 5) Vehicles must remain in parking lots. No unauthorized vehicles allowed on the course. 6) Park District events, activities & functions take priority use of the course and park facilities. Select baskets may be removed for a period of time to facilitate event needs. 7) Use caution around pavilions, buildings and other structures. 8) No open alcohol allowed on the course. 9) No littering. Please use trash cans located around the course. 10) Vandalism of equipment, facilities or park district grounds is strictly prohibited. 11) In the event of an emergency, Dial 911 or call (815)458-2341 to reach the Braidwood Police Department & Fire Department. 12) Report any damage to the course to the Braidwood Park District Office at (815)458-3896. From time to time it may be necessary for Park District officials to close the course or a portion of the course to facilitate park district events, facility rentals, activities or festivals. If the need for closure is deemed necessary, a notice will be posted here as well as on the home page of this website. Click the link below to view the course map. You may also print it out. Play 2 rounds and walk over a mile!! Parking: Parking is available in the south end of the Old Smokey City Park near the baseball fields (intersection of North Lincoln Street & West First Street). Alternate parking is available near the skate park which can be accessed through the West Second Street entrance to the park. Currently, only intermediate level tees are in place. Eventually, beginner level and advanced level tees will be added. Information shown below pertains to intermediate level tees. Information on the beginner & advanced level tees will be added once they are put in place. Hole #1 ***SPECIAL NOTE FOR HOLE #1 - Hole #1 will be reconfigured in the coming months to accommodate the new ball field that is being created in the park. More details and updated hole information will be shared as soon as it becomes available. Hole Specialization: Throw from "on top of Old Smokey!" Hole Specialization: Throw around the left side of the marked trees for white tee (tournament play) and always for blue tee. Hole Specialization: Time to test your anhyzer skills. Trees along the right side of the hole may help or hurt you here. Notes: Please be courteous of path walkers. Hole Specialization: Twin trees with hole 9 (white tees). Hanging Basket!!! Hole Specialization: Uphill hyzer shot. Watch our for that tree. Hole Features: Trees, Elevation, Dunes. Hole Specialization: Welcome to Mt. KillScore!! Hole Specialization: Bring out the big guns for this bomb of a home and try not to get "stumped"!! Hole Specialization: Split the trees for a field goal ace!! Hole Specialization: Twin tees with hole 4 (white tees), cement boxes. Notes: Please be courteous of path walkers and baseball players. Click on the link below for a printable version of the above course overview. If you've had the chance to try out the course please take a few minutes and complete our online course survey. Let us know what you think both pros & cons. We welcome all suggestions that you may have as well.